Up for sale Direct from the Ginza Strip in Japan. 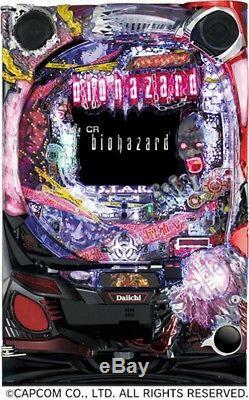 CR Biohazard (Resident Evil) Pachinko. Yet another New Pachinko Machine to hit the USA Soil! This is the more highly sought after "Zombie Head - Infected" version rather than the "0" version that we've had in the past. Resident Evil(also known as Biohazard), a world famous survival horror game that was even made into a movie! As of now, there are 10 game series and its latest work of Resident EvilRevelations 2 (Resident Evil: Revelations 2) is a smash hit! Being a second pachinko machine, it bases its story on the 5th game of the series, Resident Evil. Image quality and accessories overwhelm the previous machine, and the playing speed depends on the kinds of jackpot you win. You won't be disappointed! This is a Resident Evil Game - in Japan the franchise is called "Biohazard" but it's the Raccoon City & Umbrella Corp we all know and love.. Yet another truley awesome arcade machine for your game-room, man-cave, or home theater! This unit is a regular Pachinko - so we'll include 400 balls so you can keep playing! It's a piece of heaven ready to add to your game room! Yes, we've got them. The HOTTEST little known game from the other side of the world. A little late night searching to discover what was in that R2D2 unit back at C-4. In a nutshell: Gambling is Illegal in Japan. After WWII, someone figured out how to bypass that rule with these Vertical Pinball games. Apparently laws in Japan require Pachinko Machines to be replaced every year so what to do with all these perfectly good entertainment devices?? Unfortunately that R2 was a custom job but we've seen some really talented work from collectors over at the RPF. Maybe someone will design a case for us? Direct from Japan's Pachinko Parlors. HUGE 16 main LCD HIGH DEFINITION PLAY FIELD The digital display that plays Animated footage made specifically for this Lupin Game. The Game is quite simple, almost like a vertical Pinball Machine... Load up the machine and front hopper with balls. A quick turn of the handle causes to balls to be fired one at a time up to the top of the machine. They then cascade down though various gates, pins, gears & wheels accumulating points (& thus more balls) for you. Depending on how far you turn the handle changes the force and the aim of the balls. The primary goal is to aim for the "Start Gate" which start the bottom center wheels spinning and depending on what 3 images appear, move you up the levels. Change levels and short movies run on the main screen. Various Cut-Scenes and music play at different points during play along with animatronics - A Zombie Head and Hands Pop out around the screen & this version has a touch screen in the center tray to all a new element of interactive play! It's a total immersion in game from the start. Resident Evil come to life on a beautiful 16 inch LCD display with actual film clip animation and crisp audio theme tracks. Catch the fever of CR Biohazard pachinko today. This item makes a AWESOME game room upgrade! If your in the neighborhood drop by and play a round with us on ours, we have more machines on order and will list those here as they arrive. Please Note: These are the Actual Machines used in Pachinko Parlors and thus may have a few minor scratches on them. Also they were originally designed to be installed "in the wall" in Japan so they have "Open Backs". Local customers we do offer a "White Glove" Custom Installation in your home. We can also provide instructions for building your own cabinet but it is totally not necessary for use. Nor can they be modified to accept any coin/token/etc of any kind. These Machines are for AMUSEMENT purposes for Home use only. We are not to be held responsible for any illegal or misuse of these machines or any violations of local or State laws. They run on Pachinko Balls that's it! They are however VERY FUN and addictive and tend to be found in groups of two or more. Check out our other Movie Themed Collectibles.. WE ARE fully Authorized by for Everything we sell. The item "CR Biohazard Resident Evil Pachinko Machine Japanese Slot Pinball Awesome" is in sale since Monday, October 22, 2018. This item is in the category "Collectibles\Arcade, Jukeboxes & Pinball\Pachinko". The seller is "billanddeb" and is located in Monroe, Connecticut. This item can be shipped worldwide.